Foremost Electronics now provides the icotek EMC-KEL cable entry system which offers a cost-effective alternative to expensive EMC cable glands as a way to divert and block conducted and field bound EMI disturbances. The EMC-KEL-U and EMC-KEL-E entry frames are based on the existing very successful KEL-U and KEL-E product ranges. Providing a conductive surface, interferences in the cable shields on the control cabinet can be easily dissipated. Field bound disturbances are suppressed by the metallisation between the EMC-KEL and the enclosure metal wall where a conductive flat gasket (included) is mounted. 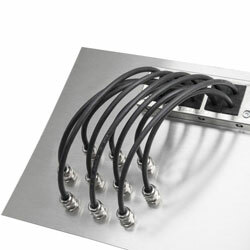 Key features of the range include reliable diversion of both conducted and field-bound disturbances, high dissipation values, excellent shielding effect for EMC tightness, 360-degree contact to cable shield, grommets made entirely from conductive elastomer, high cable density, very attractive and scratch-resistant surface and depending on mounting type sealing of up to IP66 is possible. Applications for the products include machine tools, wind turbines, solar technology, railway systems, vehicle construction and packaging machines, automation and robotics.